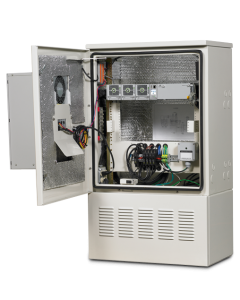 The Emerson NetXtend Enclosures offers thermal management, battery backup and room for wireless carrier equipment to meet your cell site application needs. 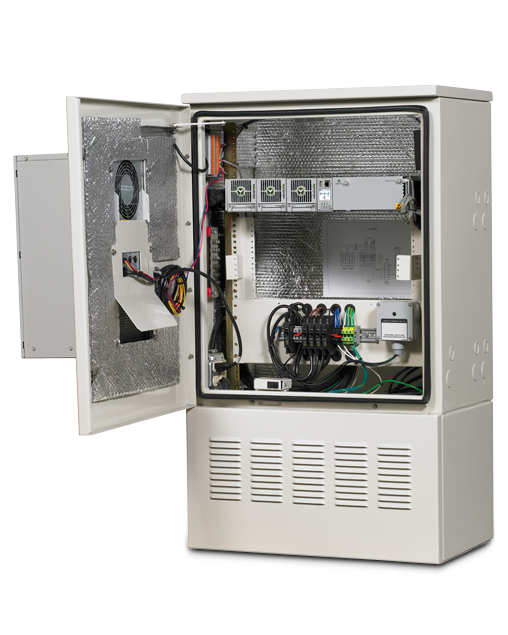 The Emerson NetXtend Equipment Enclosures is a compact and flexible enclosure solution for housing electronics, distribution, and battery backup equipment in outdoor telecom networks. To provide maximum protection for your equipment investment, the NetXtend Sole Enclosure is designed and tested to withstand the most severe environmental conditions. Thermal management is achieved through use of heat exchanger or air conditioner cooling which keeps electronics from exceeding their optimal temperatures, yet never introduces outside air and pollutants into the equipment chamber. The the NetXtend Sole cabinet is extremely flexible, and a modular approach is taken wherever possible so the cabinet can be quickly configured to meet your exact requirements. This cabinet can economically house a variety of next generation electronic equipment including telco backhaul, fiber distribution, and radio equipment for wireless applications. Door mounted heat exchanger or air conditioner for thermal control. 120 V or 208/240 V single-phase AC power input options available along with optional AC surge protection device. Optional vented base chamber for batteries, including Ni-Cd. Accepts NetSure™ 502 (-48 VDC) power system; integrated or external DC distribution available with optional DC surge protection device that protects entire DC bus. Side mounted customer access module available. Power systems designed to meet GR-63-CORE (NEBs), GR-1089-CORE (EMC) and NEC safety requirements. Designed to meet Telcordia’s GR-487-CORE, Issue 2 requirements. UL Listed to NWIN 2416 requirements.